← “Weight” – They’re the B.M.O.C., Phat!, Heavy! By now, you may have a better understanding of how and why you need to grow in the Body of Christ. But with so many possibilities, where should you start? How about with a mental image of what you want to develop. Professionals in business and athletics often refer to this as a “vision”: a specific picture of a better future. Vision helps us focus on a clearly defined target that guides our progress and enables us to say “no” to things that would waste our time or lead us astray. In an earlier devotional on “sacrifice”, I suggested that all of our actions are an attempt to fulfill some sense of purpose, but are we seeking God’s purpose or merely trying to relieve personal stress? Listen to Paul’s vision. “Know ye not that they which run in a race run all, but one receiveth the prize? So run, that ye may obtain. And every man that striveth for the mastery is temperate in all things. Now they do it to obtain a corruptible crown; but we an incorruptible. I therefore so run, not as uncertainly; so fight I, not as one that beateth the air: but I keep under my body, and bring it into subjection: lest that by any means, when I have preached to others, I myself should be a castaway.” (1 Corinthians 9:24-27) Serious exercise is not random. Athletes train toward specific goals. 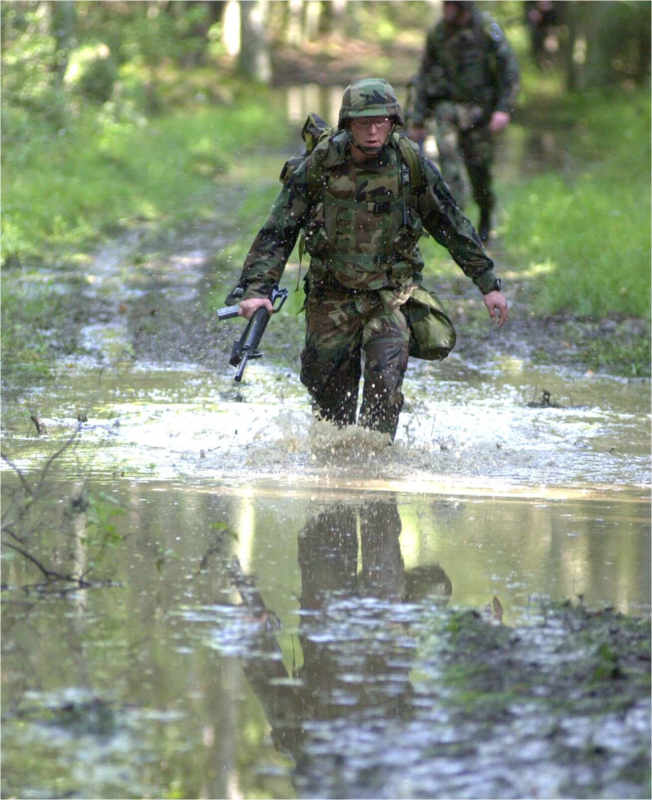 They run before breakfast to burn stored fat; they work larger muscles first because those take more effort to reach muscle failure so they can still hit the smaller muscles afterward; they track their progress; they seek accountability; and when every other Soldier is on treadmills and weights in poor weather, they run outside and do pushups in order to prepare for the actual conditions of their PT test. Let’s pause for a moment to reflect on some of the goals that we may be pursuing. Are we working for a certain image in the mirror or well-rounded fitness in Christ? Is our goal God’s or ours? What do our preferred routines reveal? Might our preference to exercise in private reflect that we fear others’ judgments? Or do we exercise in public so everyone will envy our physique? It’s easier just to run on auto-pilot, isn’t it? I, for example, have to guard against using exercise to numb out the pain that I experience in my work as a pastor. If there is pain in our lives, God wants us to learn from it. But if my vision is to have a pain-free life, I am more likely to self-medicate with busywork, food, sleep, exercise, etc. and miss the relationships that God has for the hurting. We must embrace a vision that includes a biblical view of the Body of Christ: genuine relationships through interdependent living. A few years ago, Rick Warren published a book that was an immediate best seller: The Purpose Driven Life. Whether or not we like everything in it, the book’s popularity confirms that people want a clear picture of what right looks like. Proverbs 29:18 says “Where there is no revelation (חזון or “khazohn”), the people cast off restraint; but blessed is he who keeps the law.” The Hebrew word can be translated as “revelation” or “vision” – a vivid picture of God‟s direction. Everything we do reflects our pursuit of some purpose. But are we on auto-pilot or being deliberate toward God‟s vision for us? Even Jesus lived by a clear sense of vision. Hebrews 12:2-3 encourages us “Looking unto Jesus the author and finisher of our faith; who for the joy that was set before Him endured the cross, despising the shame, and is set down at the right hand of the throne of God. For consider Him that endured such contradiction of sinners against Himself, lest ye be wearied and faint in your minds.” Jesus looked beyond His suffering and envisioned the joy to come: saving His people! It’s amazing – we are part of Jesus’ vision, and He loves us even more than He valued His own life! This love is what motivated and directed Paul, too, even in the hardest times. Look at Philippians 3. While Paul is in prison, he writes with excitement about his longing to take hold of the One who came to take hold of him (verses 13-15). The context suggests a picture of a sport in which an athlete is reaching forward for a prize. Jesus was Paul’s passion and focus. He writes in the future tense about an intimacy with Him that he doesn’t fully know yet, but his zeal is motivated by what he’s already experienced in Him. The larger context of the whole chapter reveals that Paul is concerned about false teachers who are distorting the vision of who God really is – gracious. God does not love us if we do our best. He loves us because He gave His best: Jesus, Who died in our place. We are to be motivated and focused because of His love. Our value, security and purpose are secured in Christ. What, then, will you envision for your life to fulfill God’s goal for you? If you’d like to receive more posts from this series, “Workout Wednesdays”, you can subscribe to the tools4trenches blog. This entry was posted in Workout Wednesdays and tagged devotional, vision, W.A.I.T. training devotional. Bookmark the permalink.